Tablets are cool. But they have a purpose too. Larger screens, higher resolution and more mileage out of the battery make them better suited for certain tasks. That’s why people are not only fascinated by them but do end up actually needing one. What’s not so cool is the need to carry two devices all the time, especially when one of them won’t fit into any reasonable pocket. That's where the Samsung Galaxy Note comes in. It aims to squeeze the high-res screen and battery longevity of a tablet into a package that is still pocketable. And it does - but success is by no means guaranteed. There's nothing between the Galaxy Note and 7" tablets. And while it sounds good to have all that room to themselves, Samsung need to fill it with meaning. 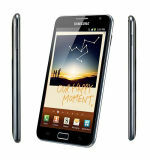 The right kind of users will be easily convinced of the advantages of an enlarged Galaxy S II. Not so sure about a compressed tablet. But there's no reason to go into this with a skeptical attitude. Just look at that specs sheet! There aren’t many smartphones around that can instill an inferiority complex in the Galaxy S II, but the Galaxy Note does a pretty good job of it. The Exynost chipset's got a faster CPU, the AMOLED screen has a million pixels and, most importantly, there’s more of it. And even the notoriously power-hungry Android will have a hard time pushing through the 2500 mAh battery in a day, which is what many modern-day smartphones will do more often than not. And there’s the S Pen, which promises to add a whole new dimension to the smartphone experience. Good old-fashioned notepads haven't been having a blast lately, but the Note threatens to put another nail in their coffin. Quite a beast we have on our hands here and it won’t be easy taming it. We'd better get to it then and keep the Galaxy Note busy. The hardware inspection starts right after the break.